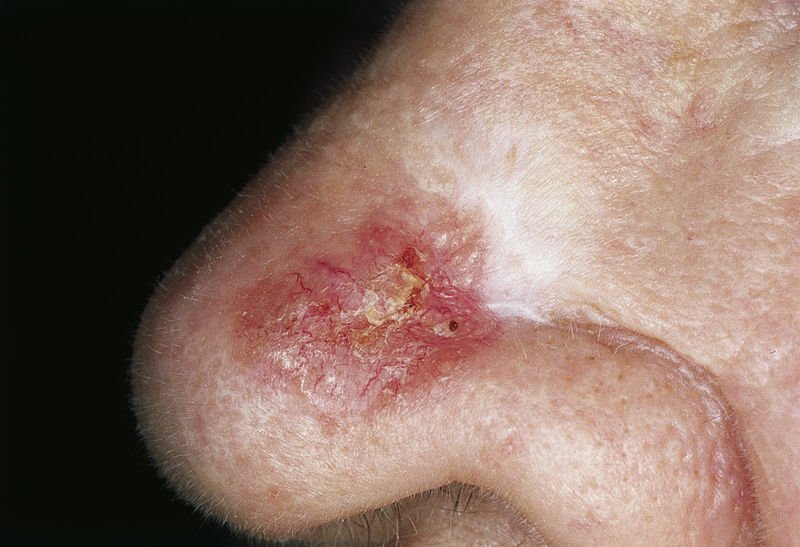 Basal cell carcinoma (BCC) the most common but least dangerous type of skin cancer. It develops from cells in the basal layers of the epidermis. There are different types of basal cell carcinomas so not every BCC looks the same. They commonly have raised borders, a pearly central area and visible small blood vessels. They may be scaly or look like a scar or chronically inflamed patch of skin. Some BCCs are pigmented, but this is unusual. Risk factors for the developing basal cell carcinoma are chronic exposure to UV light, fair skin, immunosuppression and the rare conditions xeroderma pigmentosum and Gorlin syndrome. The majority of BCCs are favourable and can be removed surgically with a margin of 2-3mm of surrounding skin with a very high chance of complete clearance. If the pathology results show that the microscopic margin is less than 0.5mm your surgeon will usually recommend further excision to reduce the risk of recurrence. If you have an aggressive type of BCC a larger margin of surrounding skin is usually excised. The prognosis is best for BCCs that are small, well defined, excised early, excised completely and not invading nerves or other structures. Surgery can be done under local anaesthetic, or under sedation anaesthetic, or general anaesthetic. If the BCC is small it will likely be excised and the skin edges stitched together. If it is bigger then a skin flap or skin graft may be required. Your surgeon will explain the options, risks and benefits of each type of reconstruction to you. Once the cancer is excised the tissue is sent to a pathologist and examined under the microscope to determine if the cancer has been completely excised and how much of a clear margin around the cancer has been achieved. These results are not obtained at the time of surgery, so if the results show that the cancer has not been completely excised your surgeon will recommend additional surgery so that a complete excision can be achieved. This is important to reduce the chance of the cancer coming back. During your recovery you should keep any dressings dry and intact. Under some circumstances we recommend using an ointment on the face (with no dressing); the ointment should be applied 2-3 times a day to keep the area moist. If the surgery is on your hand or forearm a sling may be helpful to keep the area elevated. The surgery is not usually particularly painful and usually over the counter medications such as paracetamol and/or ibuprofen will be sufficient to keep you comfortable. The expected recovery time varies according to the area and size of the surgery; your surgeon will be able to let you know what to expect as far as return to work, driving and your usual activities. For information on scars and prevention after surgery please click here. Can I use an anti-cancer cream instead of surgery? There is a cream that can be applied 5 times a week for 6 weeks to treat superficial basal cell carcinoma. The active ingredient is imiquimod, which is prescribed and sold under the tradename of Aldara. Imiquimod is an immune modulator which activates the immune system to cause death of the BCC cells. Studies show a success rate of around 80% in clearing the BCC at 5 years. It is ineffective in 5% of the population, because these 5% lack a certain type of cell receptor that is needed for the active ingredient to work. Using an anti-cancer cream to treat BCCs is a valid option. However, you need to have a biopsy to ensure that your BCC is of the superficial type, then apply the cream for 6 weeks and you will need follow up for a couple of years to ensure that the BCC has been adequately treated. For these reasons I almost always recommend surgical treatment of basal cell carcinomas, because I believe it offers my patients the most reliable and predictable outcome. Will I need radiotherapy or chemotherapy? It is unusual to need radiotherapy for a simple BCC – radiotherapy is generally reserved as an additional treatment for very extensive skin cancers. You will not need chemotherapy. Rarely BCCs are treated with radiotherapy only; there are downsides to this and it is not the usual approach to treatment. You will have post op visits scheduled to learn the pathology results, check the wound, remove any non-dissolving sutures, receive advice about scar management and answer any questions you have. Sutures on the hand and fingers are usually removed after 10-14 days. After the wound is healed you will also have follow-up visits scheduled to check for recurrence of the BCC. The frequency and duration of these follow-up visits will depend on multiple factors including your pathology results, how far away you live from your surgeon and whether your GP is happy to be involved in the follow-up. The good news about BCCs is that they are not known for spreading (metastasizing) to other body sites. Once the BCC is treated you do not have to worry that it will appear in your lymph nodes or other organs. It is important, however, that you perform regular skin checks and seek medical attention if you have any new skin lesions or spots. If you have developed one BCC there is a reasonable chance that you will develop another during your lifetime. Once you have had one skin cancer it is wise to take steps to prevent the development of future skin cancers. Often patients who have had a skin cancer tell me, incorrectly, that they don’t see any point to starting to protect their skin from the sun because they’ve already had large amounts of sun exposure during their lifetime. We know that limiting sun exposure after you develop your first (or hundredth) skin cancer will reduce the likelihood of you developing further skin cancers. So do be SunSmart and heed the “Slip! Slop! Slap!” message – but equally don’t become so scared of the sun that it stops you from enjoying life in Australia. For more information and recommendations on skin cancer prevention please click here.